"Consumption is determined by Income" Consumption is defined as consumer spending on goods and services over a certain period of time. In this case, disposable income is used as this is the aggregate amount of money a person earns during a given period. There are a number of factors which determine how much a household consumes. The relationship between consumption and these factors is called the consumption function. The most important factor of consumption is disposable income but other factors can bring around significant changes in consumption. One factor of consumption is the amount of wealth a household has. A household is constituted of the general public as distinct from a firm or business. In common parlance the general public is often called consumers Wealth is made up of physical wealth and monetary wealth. Physical wealth is durable items such as cars, houses and furniture whereas monetary wealth is made up of cash, shares and pension rights. 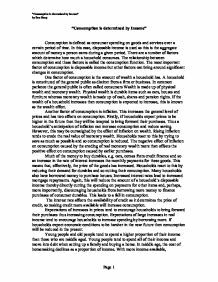 If the wealth of a household increases then consumption is expected to increase, this is known as the wealth effect. ...read more. Expectations of large increases in real income tend to encourage households to increase spending by borrowing more. If households expect economic conditions to be harsher in the near future then consumption will be reduced in the present. Young people and old people tend to spend a higher proportion of their income than those who are middle aged. Young people tend to spend all of their income and move into debt when setting up a family and buying a home. In middle age, the cost of homemaking declines as a proportion of income. With more income available, households often choose to maximise savings in preparation for retirement. Following retirement saving stocks are reduced in order to supplement pensions. Therefore, a change in the age composition of the economy may lead to a change in the rate of consumption and saving. The greater the proportion of young and old households to middle-aged households in an economy, the greater will be the level of consumption. The Keynesian consumption function lays emphasis on the relationship between planned current consumption and current disposable income. ...read more. Another factor is that an increase in interest rates tends to lower both stock and share prices. This leads to a fall in wealth, permanent income and current consumption. An increase in interest rates also leads to future incomes being less valuable. An unexpected rise in wages will lead to an increase in permanent income. Freedman argued that the long run average propensity to consume (APC), the amount of income spent, was that households spend all their income over their lifetimes. Hence, APC is stable. In the short run, however, wealth and interest rates change. Measured income also changes and much of this is unexpected. Income which households receive but don't expect to earn is called transitory income. Initially, transitory income will be saved, as households decide what to do with the money. Then it is incorporated into permanent income. This theory contradicts the Keynesian hypothesis that current consumption is a stable function of current income. Generally the relationship between consumption and income is positive but not perfectly. Income is the most significant factor when concerning consumption but other factors are enough to play a significant role when the determinants of consumption are involved. 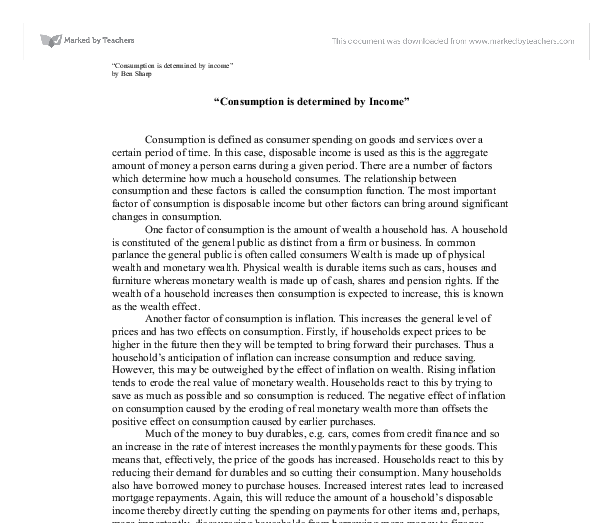 "Consumption is determined by income" by Ben Sharp Page 1 ...read more. More than 1,300 licences for the installation of CNG stations have been issued of which 500 CNG (38.5 %) stations have been actually established in different parts of the country compared to 362 in 2002-03, an increase of 38 percent upto March 2004.